While celebrating the winter holidays usually entails carb counting for the sweets and treats at every school, community, and family celebration, here’s one festive activity that requires no diabetes math or extra insulin. Gather up your child’s type 1 diabetes trash and make it into one of these cute ornaments together! Count the number of pods (or other empty/used diabetes supplies) you will need to cover the surface of the craft ring. For a 6-inch craft ring, we used 9 pods. Prep the pods by snipping the cannula with scissors, peeling off the adhesive backing, and removing any residue using an alcohol swab. Prep other pump or diabetes supplies in a similar fashion. Pour green acrylic paint into a plastic cup. 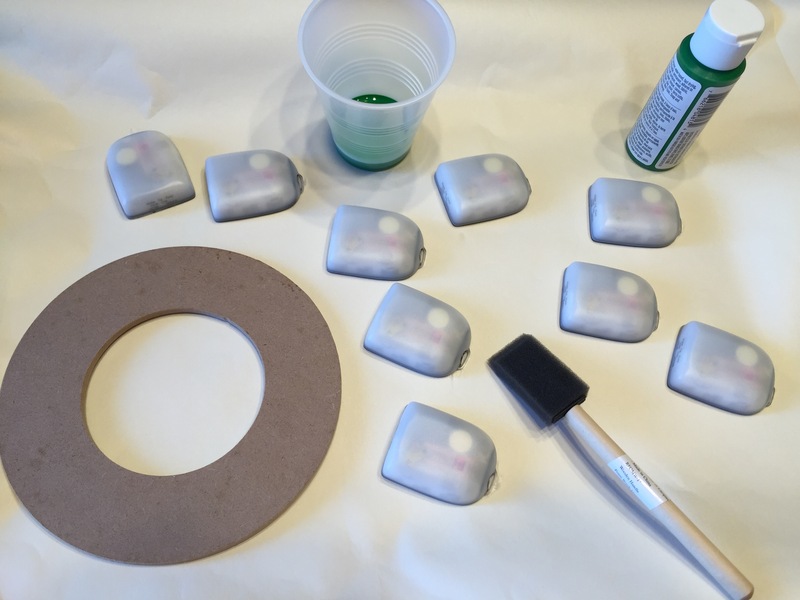 Using a foam brush, paint the tops of the pods green (don’t worry about the back). 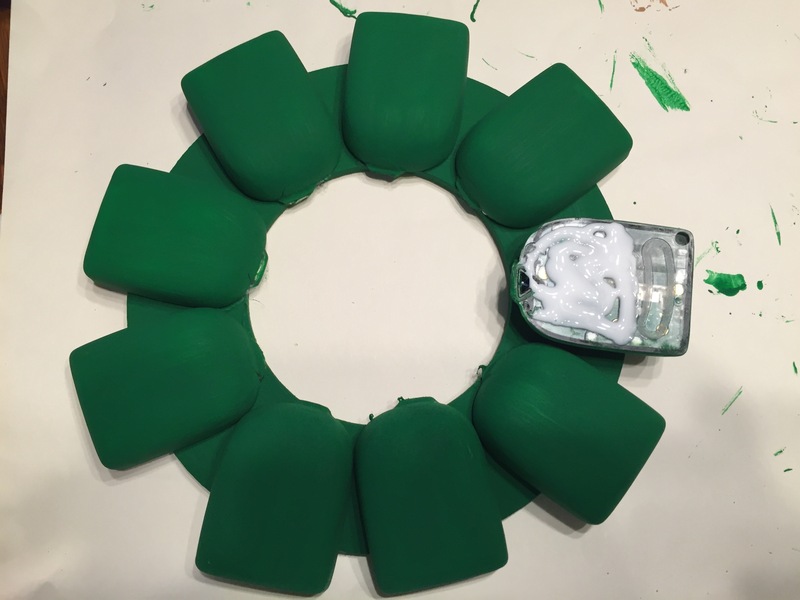 Paint the top and edges of the craft ring green. (It can help to place the ring on a small box from your recycling bin or another elevated surface to make it easier to lift back up when you’re done.) Let the pods and craft ring dry. Add additional coats of paint as necessary to get the coverage you want. Once dry, arrange the pods on the craft ring as pictured, leaving a small space in the ring to later drill a hole for hanging. One by one, apply craft glue to the bottom of each pod and place it back onto the ring. Allow the glue to dry thoroughly. Drill a hole near the top of the craft ring. This hole can be used to hang the wreath on a hook or to tie a ribbon through for hanging. Add the ribbon bow using craft glue. If the bow has a wire, it can be threaded through the drilled hole and taped down in back. For the final touch, place the red adhesive rhinestones onto the pods. Prep the pods as for the wreath above by removing the backing, snipping the cannula, and cleaning with an alcohol swab. Cut a 6-inch length of tan or brown ribbon. 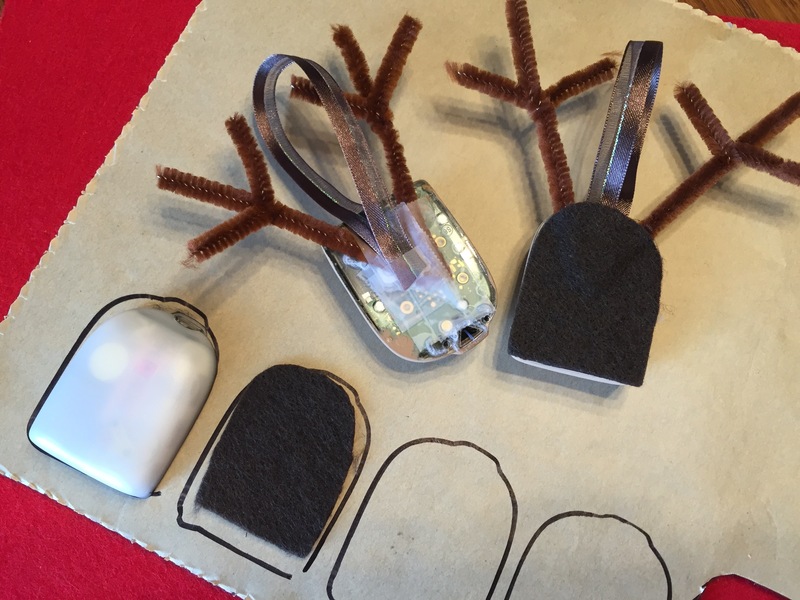 Create a loop to hang the ornament from and tape it to the back of the pod between the antlers. Using a pod as a template, trace the shape onto the paper side of the brown adhesive-backed felt. Repeat this for the number of ornaments you’re making. Cut out the felt shapes and stick one to the back of each pod, covering the pipe cleaner antlers and ribbon loop to secure. Decorate the faces of the reindeer by placing googly eyes on the front of the pods. Use craft glue if the eyes don’t have adhesive. Glue a red pompom to each pod to create the nose. 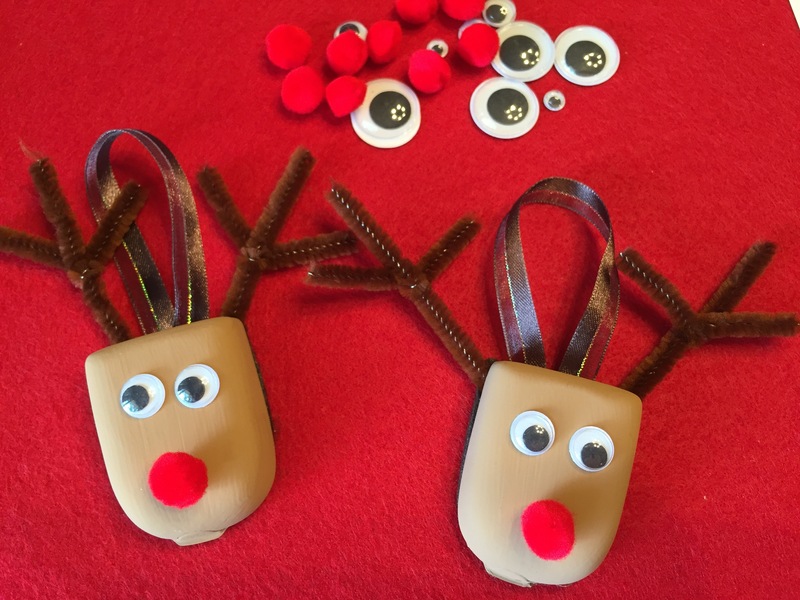 Once the eyes and noses have dried completely, you can keep decorating to give each reindeer a personality. Tie red ribbon bows to one reindeer’s antlers or draw on eyelashes using a black paint pen or marker. You could create different ornaments to represent each member of your family or each of the reindeer that pull Santa’s sleigh!